Flat Lake Park features many small, interconnected lakes, and it is locally popular as a destination for one-to three-day canoe trips (locals call the area the Davis Lake Chain, after the lake nearest the access). In winter, the area is suitable for cross-country skiing and snowshoeing. 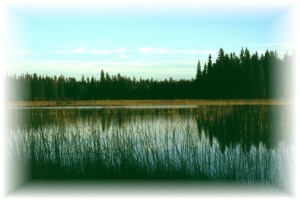 The park's natural feature are the wetlands and lakes are excellent habitat for waterfowl, aquatic mammals and moose. The park is a wilderness area that is not regularly serviced or patrolled. Fishing is not recommended because lakes along the chain are shallow and support few, if any, fish. The park is about 20 km southwest of 100 Mile House. The description of the access route to the park that appeared previously on this web page is under review. BC parks staff are researching the best access route. The closest communities, towns and cities are 100 Mile House and 70 Mile House. History - Flat Lake Park is one of the new parks identified in 1995 under the Cariboo-Chilcotin Land-use Plan. Under the Plan, grazing and trapping are still permitted in the park. In 2013, 26 hectares were added as part of the Cariboo-Chilcotin Land-use Plan Goal 2 (special feature) process. Cultural Heritage - Little is known about the history of the park’s land, and no specific archaeological sites have been identified. Since the area is rich in wildlife, it may have been, and may still be, used for sustenance hunting by First Nations. Conservation - Located in the Cariboo Plateau, a landscape heavily influenced by glaciation, the park features kettle lakes. These small shallow lakes formed when large buried ice pockets were left to melt after glacial ice receded. Uplands were smoothed by the glaciers, so the land is quite flat, true to the name of the park. Flat Lakes is rich in biodiversity because of the variety of ecosystems found within its borders. The lakes are small, with complicated shorelines featuring rock outcrops, small islands, marshes and bogs. An abundance of aquatic vegetation carpets the shallows - cattails, sedges, rushes, waterlilies and buckbean. The surrounding forest is composed of Douglas-fir, lodgepole pine, spruce and aspen. Wildlife - Wetlands connect most of the lakes, and these provide excellent food and shelter for waterfowl such as loons and herons, and mammals like moose, black bear, muskrat and beaver. Some species found in the park are rare or even facing threats of extinction, for example, sandhill crane and American avocet. An approved management plan for Moose Valley / Flat Lake Provincial Parks [PDF 1.06MB] is available online in pdf format. Canoeing is the best way to see Flat Lake Park with its series of small lakes. To paddle the entire chain usually takes two days. Kayaking is possible, though since portages are frequent, it is more tiring. Pets/domestic animals must be on a leash at all times and are not allowed in beach areas or park buildings. You are responsible for their behaviour and must dispose of their excrement. Backcountry areas are not suitable for dogs or other pets due to wildlife issues and the potential for problems with bears. If you must bring your dog, ensure it is under control at all times. There are no lifeguards on duty at provincial parks. The lakes are shallow and warm up relatively fast. With the abundant aquatic vegetation and muddy bottom, however, swimming can be recommended only for the truly determined. There are cross-country skiing and snowshoeing opportunities at this park. However, access and trails are not maintained during the winter. If you must have a fire, please burn only dead and down wood, and be sure to extinguish the fire fully. Dead wood is also an important habitat element for many plants and animals and it adds organic matter to the soil - so please use it conservatively, if at all. Be prepared to bring a portable stove for cooking.